New Launch - the KD group have added another property to their portfolio-Highwood house has just undergone an extensive refurbishment. Highwood House is a luxurious self-catering holiday cottage in Saundersfoot occupying a peaceful and secluded spot just a 5 - 10 minute walk from Saundersfoot's award winning beach and picturesque harbour, from where boat trips around the beautiful Pembrokeshire coast depart daily during the summer months. Saundersfoot village boasts many delightful beach front cafes and shops, restaurants and traditional pubs. The 186 mile Pembrokeshire Coast Path passes right through Saundersfoot village and, during low tide, much of the coast path can be walked along the beach. There are many activities and attractions nearby including Folly Farm, Oakwood Theme Park and Heatherton World of Activities and the historic sea-side town of Tenby is just a short drive away. This self-catering cottage is located next door to Amber Cottage and Oaktree Lodge and the three can be rented together for larger families wishing to holiday together. Nestling in a delightfully landscaped garden and terraces with an attractive mix of apple & plum trees, shrubs and rockeries, Highwood House is a detached upside down house which has been recently renovated to the highest standards whilst embracing its truly unique design. The cottage sleeps up to 8 people plus a cot and has been professionally renovated with a focus on family life and entertaining. Entering into the large hallway, full height interior windows and vaulted ceilings add to the spacious feel of this 5 star property. Doors lead off to the living areas and cloakroom with toilet and whb and stairs lead down to the 4 large bedrooms. Through to the lounge/dining room with a feature floor to ceiling stone fireplace with gas coal effect fire and a 52” flat screen Sky television inc sky sports. Both the lounge and dining area offer comfortable seating for up to 8 people and large windows capture the views over the bay, village and surrounding countryside. Stairs lead up to the mezzanine level which creates a relaxing space with comfortable seating for up to 5 people, flat screen TV and more spectacular sea views right out over the bay and toward the Gower Peninsula. The kitchen leads outside to the courtyard which, peaceful and enclosed, provides the perfect space to relax in the sunshine or watch the children play. 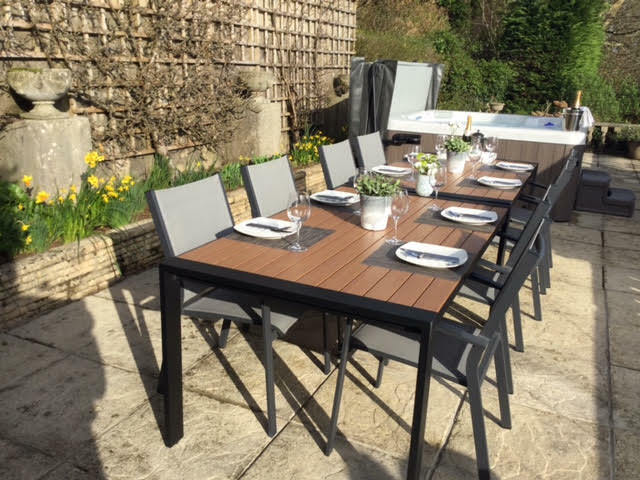 A few steps lead up to the south facing terrace where alfresco dining can be enjoyed with a BBQ, outdoor furniture for up to 8 people and sun loungers. 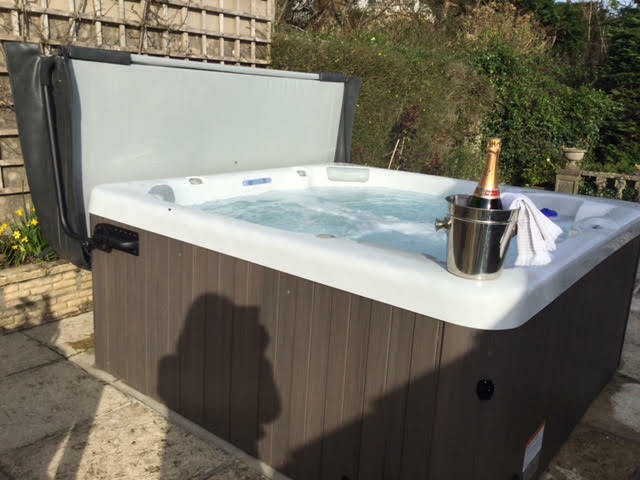 Afterwards, guests can relax in the bubbling hot tub while taking in the views over the village and surrounding countryside. 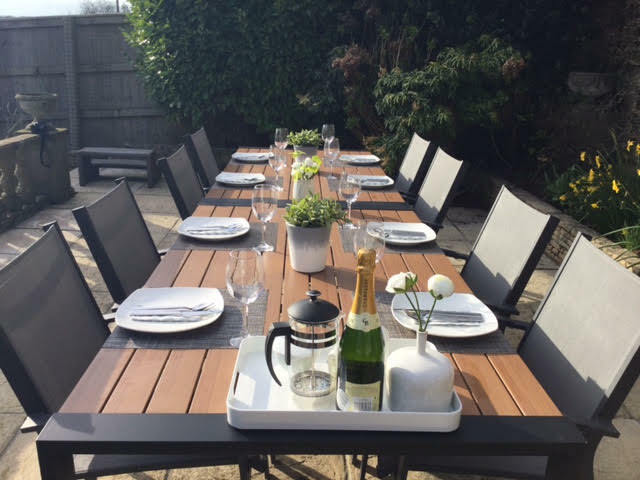 On the lower floor the master bedroom boasts a super-king size bed, walk in wardrobe and french doors which open out to the garden and patio area, where an outdoor table and chairs create the perfect spot to wake up to an alfresco breakfast! Adjoining the master bedroom is a large dressing area with plenty of storage and hanging space. Leading off the dressing area is the en-suite shower room with large shower enclosure, wc and whb. Bedroom 2 sleeps up to two people in twin beds and also benefits from french doors leading out to the garden. Bedroom 3 boasts a king size bed and bedroom 4 also sleeps up to 2 people in a double bed. All the bedrooms offer ample storage and hanging facilities. The stylish family bathroom benefits from bath with shower over, wc and whb. Mid-week and weekend breaks available Nov-March inclusive (or where there is late availability). Please note that a returnable good housekeeping and damage deposit of £200.00 is required (£400 for non family bookings) i.e. hen parties, birthday parties etc). This is payable along with the balance payment 8 weeks prior to the start of your holiday. This is returnable within 7 days at the end of your holiday, upon request. Check in is from 4pm.